Just 24 hours before, he said, he was going to stay as a boss of Turkish Football Federation, despite the pressure from media and some teams! What happened in the past 24 hours ,that changed, Mehmet Ali Aydinlar's opinion? And he said he was upset to find out, these papers came to Turkish Football Federation from UEFA, on September 6th and November 3rd and he found out this yesterday! And he said,"He no longer had the patience to continue his work in an unethical environment." Today's announcement came 24 hours after Mehmet Ali Aydinlar and his deputies would continue! Chaos goes on in the Turkish Football and Turkish Super League! During the last week,the Union of Turkish Clubs met and after the meeting, Antalyaspor president and Union of Clubs Vice President Hasan Akıncıoglu said "federation plans to propose an amendment to Article 58 that would mean a point reduction instead of relegation for match fixers." After this announcement, Fenerbahce vice president Nihat Ozdemir came out and lashed out Hasan Akincioglu for telling the meeting notes to Media! And he also said,Fenerbahce does not want to make any changes to Article 58 of the disciplinary code and wants the article as it currently is to be applied in the case of Fenerbahce, which is accused of involvement in match-fixing. 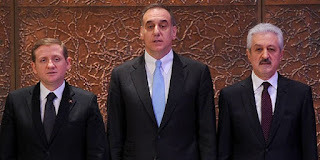 TFF(TURKISH FOOTBALL FEDERATION) ,will hold a special meeting in Ankara on January 26th,2012! The subject will be, the penalty for clubs involved in match-fixing activity. Over 300 members who belong to Turkish Football Parliament in Turkey, will decide the future of Turkish football! While this is going on, Turkish Super League matches are playing but we don't know what they are playing for? More chaos or bright beginning ? I know one thing, during this meeting there will be a lot of clashes and harsh words in this meeting ! While these things happening, Turkish Super matches taken place, almost everyday! 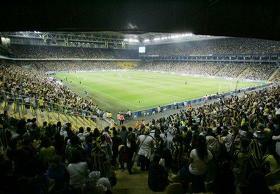 They are playing, but no body knows what will happen tomorrow, while this chaos is going on,in Turkey! Whether article 58, changes or remains same, the chaos will go on in the Turkish Football! That means,the teams involved in this scandal, will lose a lot of points that they have earned! Looking to Turkish Super League standings, out of the first eight teams, there are only two teams are not mention in this match-fixing scandal!.. Fenerbahce, Besiktas,Sivasspor,Trabzonspor,Eskisehirspor and Mersin Idman Yurdu are the teams will find them self, in point reduction, if they agree to change the article 58 on January,26th! So, that is why, what we see is not real, now! Turkish Super League teams are playing but they don't know what they are playing for ! 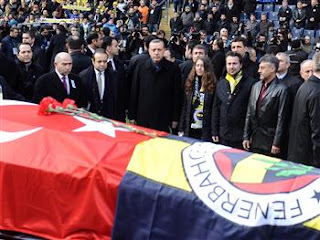 Thousands of Fenerbahce fans and fans from several Turkish clubs, bid farewell on Sunday to Lefter Kucukandonyadis, one of Turkey's top football players, who has died at 86. Prime Minister Recep Tayyip Erdogan and Egemen Bagis, Turkey's EU minister, atended the funeral ceremony at Fenerbahce's Sukru Saracoglu Stadium. Kucukandonyadis died of pneumonia Friday in Istanbul. Küçükandonyadis was the captain of Turkey's national team, making 46 appearances for his country. His club career included Fenerbahçe, where he scored 423 goals in 615 games. Born in 1925 in Istanbul to a fisherman father from Turkey's minority Greek community, Küçükandonyadis was the first player from Turkey to play abroad. He transferred to Italy's Fiorentina in 1951 followed by a spell with Nice in France. The year 2011, was UGLY for Turkish Football! The scandals,allegations,TFF's backtracks and uncertainty in Turkish Football, carried over to 2012! With all this negative news about Turkish football, Turkish Super League is rolling some how! The decision on January 26th by the TFF's "football general assembly" could well decide future of Turkish football! They are about to change that on January 26th,2012! WE will see what happens?